Twist – eating my way through Charm City! Twist is a new spot in Fells Point, brought by some DC folks. Chef and owner Jose Molina has spent some time in Greece and created a authentic mediterranean style place. When you step this narrow establishment, you’ll be greeted warmly and sent to beautifully set tables. It is a little quaint in here, with charming chotchkies. Twist is a BYOB spot; my favorite. 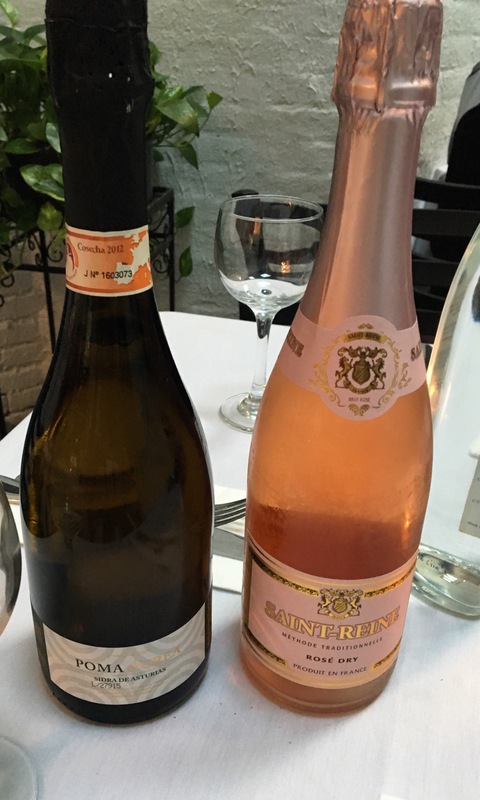 We bought three bottles, all of which they chilled table side. 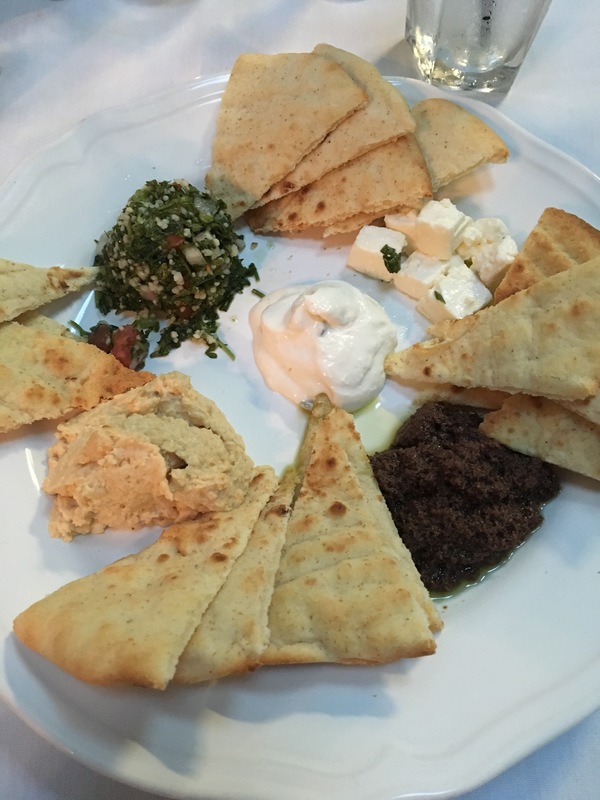 We started with the Mezze spreads – a large plate of baba ghanouj, tabouleh, and humus with tons of pita, feta cheese and Olive tapenade. It’s a perfect share dish and hits lots of tastebuds. I don’t like olives, but I don’t hate this tapenade – they must use a high quality Kalamata olive. The humus was creamy and had a nice flavor. I like the chunks of feta – super salty melding well with the garlicky, herb filled tabouleh. 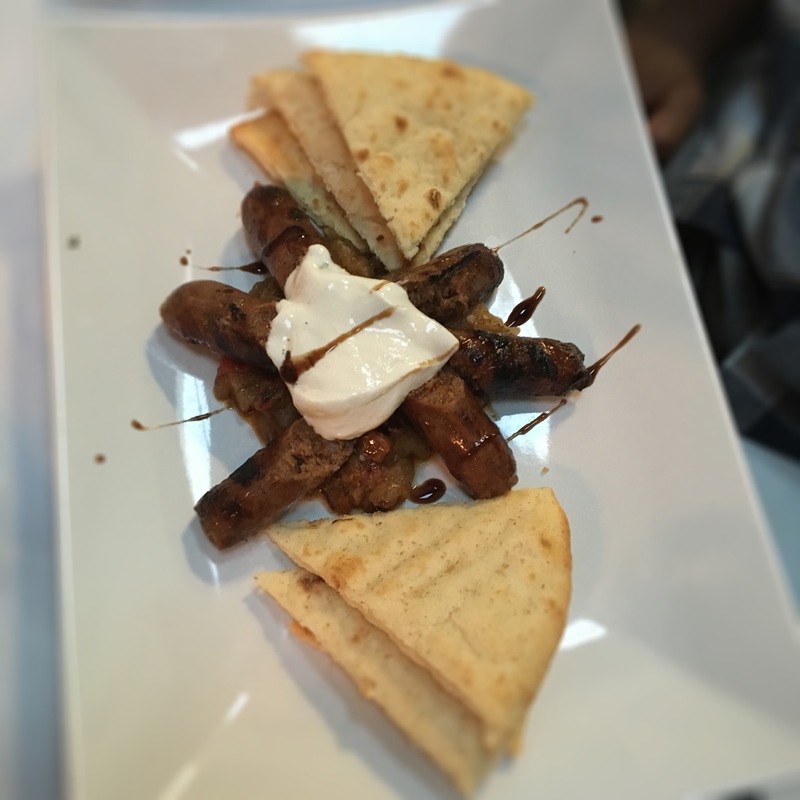 The next app was the Moroccan spiced lamb sausage they make in-house. It definitely tastes better than it photographs. It’s spicy, sweet and definitely not too fatty. They serve it over oven roasted eggplant with dollop of yogurt harissa sauce. It’s a wonderful complement to the sausage – cooling off your mouth from the heat from the sausage. One of my favorite dish of the night was the crab salad over microgreens. Huge lumps of sweet crab with fresh creamy avocado. The roasted red pepper and drizzle of balsamic brought together all the flavors. Super-well balanced. 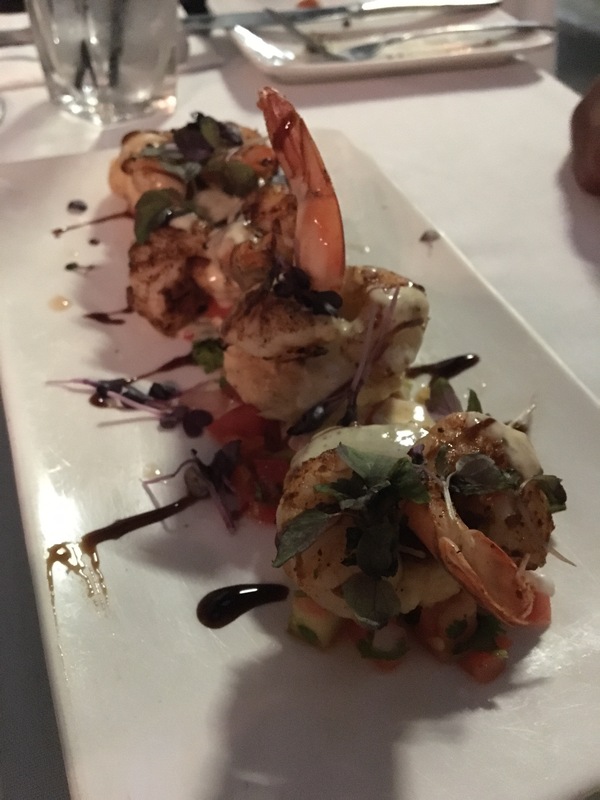 Chef made us a special with tiny crab cakes and grilled shrimp. So fun! Tiny little bites of seafood – perfectly formed crab cakes – tons of lump crab meat with very little filler. Suberbly cooked shrimp, tender without being chewy and had a lot of flavor. It was a mesh of Baltimore and Greece with the cucumber tomato relish on the bottom and the drizzles. I really enjoyed this, but I tend to like dishes with tons of flavor in one little bite. I liked just about everything here. We had a few entrées. I think the apps far surpassed the dinner dishes. I like the lobster ravioli. The scallops were actually not edible, which is too bad since the saffron pea risotto was exquisite. The service did taper off as they got close to closing, but it didn’t make for a terrible experience.